Well, it’s finally Friday. Also, it’s finally after noon. I can now say that I’m counting down the hours until the weekend…just over 3.5 to go. I have not been as productive with leather as I wanted to be this week; I am close to being finished with the custom request i have from like a month ago, but still need to stop at Michael’s for some things this weekend. Provided that I don’t get too caught up doing other things this weekend, I need to finish the bag and then start trying to stock up my shop again. I swear, every time I feel good about the amount of items I have listed, they sell and I’m left with like 3 or 4 again. Guh. I mean it’s not a bad problem, and I’m not exactly complaining. Just saying. So, there’s that. Also the weather has been cooler this last week, and it’s reminding me that autumn is not a pipe dream but is in fact an eventuality, and soon the trees will be turning colors and the air will be crisp and sometimes nippy, and all will be good. I do not want to squander a single autumn weekend inside. We recently (as in last week) purchased a 2-person tent which cuts down on excuses for not taking weekend camping trips. I’m envisioning lots and lots of camping this fall. Oh I do SO love the fall, and being outside to enjoy it. Mm. I’m getting excited just typing all of this — and it’s still mid-August, my Least Favorite Month. Speaking of it being mid-August, Matt’s birthday is tomorrow. And he would be 31, which seems like so much older than he was when he died. Today is two years and six months since he died, which…which I have thoughts about. Three years ago would have been the last time we celebrated his birthday (me and him, I mean), and it was a very bittersweet celebration. I was so afraid that whole year. I felt like something terrible was always below the surface, and I strongly suspected that it would not lie low forever and that there would be nothing I could do about it when it did rise above the surface. And I was right, of course. As awful as that year was, there were so many bright spots. It’s hard to wrap my head around. Life, man. What can you even say. Nothing that hasn’t been said a million times and in a million different ways already. It’s been a really good week on Etsy. Obviously it was an inspired idea to make a bunch of business card holders/wallets, because I just sold the last envelope-type one that I made, and someone is waiting for me to make a few more of one of the other types so that he can buy a couple at once. These are easy to make, too, and they turn out looking very nice. I made one for myself to hold business cards and really like it. I know, the one on the right isn’t a great picture, but it gives you a pretty good idea of how it turned out. The guy who bought it said that he’s cosplaying as a Skyrim mage, so this was pretty much perfect for that. 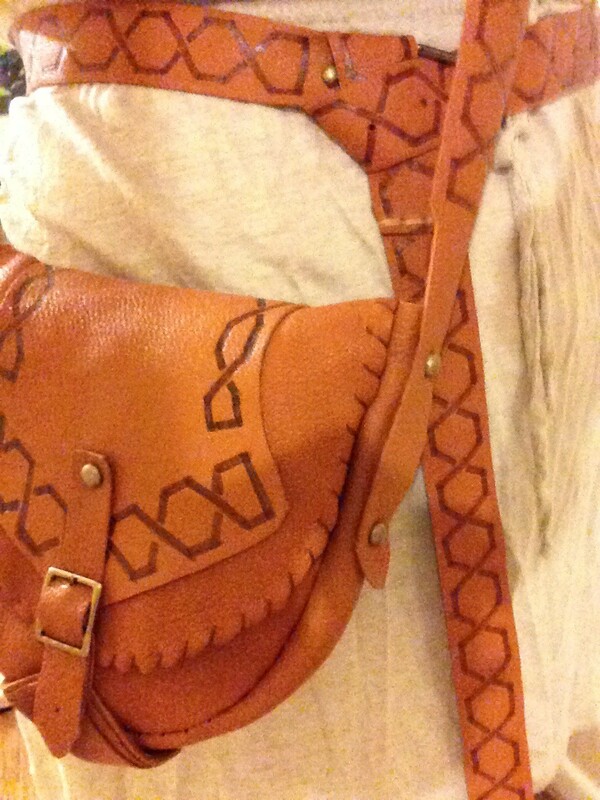 I think the burned pattern is slightly off, but I just made it to match the actual apothecary satchel so whatever. Anyway, I decided to use the money I made off of this to renew my subscription to the New Yorker. Have been going without for, um, a really long time now. I think it’s been less than a year, but I can’t remember for sure. The subscription price used to be around $50 (which was still pretty high) but has gone up to more like $100 now — waaay out of my price range. However, I will gladly trade some leather workings for a subscription, which is basically what this turned out to be. 😀 Very exciting. So yeah. There you have it. I’m starting to wonder if I need a new workspace — like maybe I should re-do my library to make it a library/leatherings studio. My living room is pretty much a constant mess and I’d like to be able to keep it orderly. Makes me feel better to walk into a clean house – plus i need to use my library more. Hmmmm. Because I know Katie is tired of me griping to her: I am so ready for this week to be over. It’s been stressful at work; schools are starting back up and people are rushing to get last-minute cleaning projects done, and to stock their janitors’ closets before all the kids get there. The office has been a bit of a mad-house, and the warehouse has really had it bad – especially the drivers and the routing department. I do not envy them their jobs this week. I have been having to try to put out fires and apologize to people all week for various things, and Thank God It’s Thursday because that just means tomorrow is Friday. I will say that largely, the clientele here is omg so many worlds better than the clientele at B&C. Good things about this week: have done cardio every day so far, and have been getting to bed early too which means that I’m not dragging every morning. It’s nice! I haven’t been snoozing my alarm until the last possible minute all week! I have to make it a priority to finish these custom bags over the weekend. I have two people waiting…neither are in a rush, which is good and bad. I’m terrible without deadlines. So it’s been a different week so far! My dear boyfriend is out of town for who knows how long…maybe another week, I’m not even sure. Anyway, no matter. 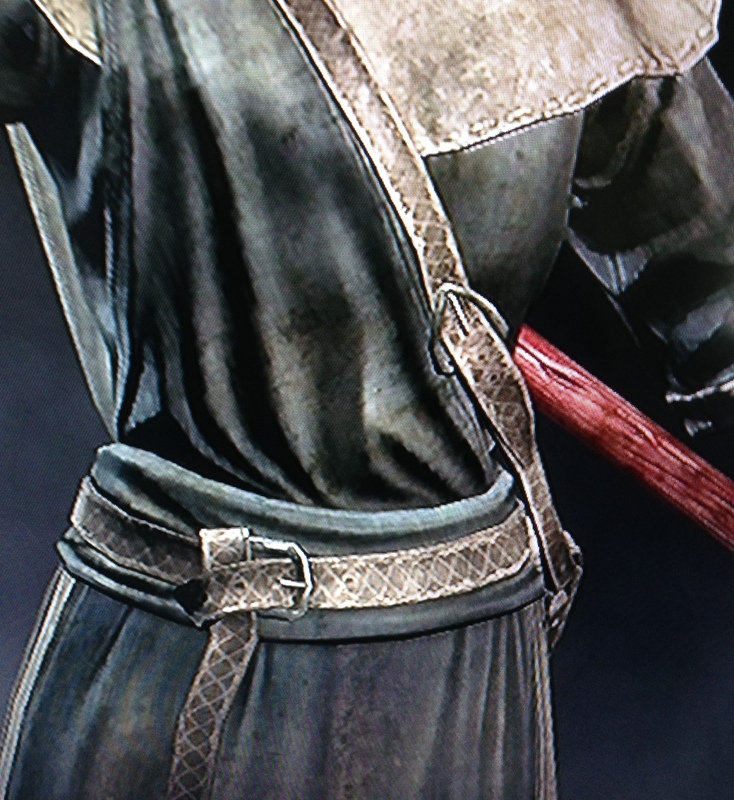 I have been focusing on three things this week so far: working out, Skyrim, and Leatherings. Have been doing cardio so far this week and as always (always) it’s making me feel better. I’ve been playing a bunch of Skyrim too, but that’s normal. Mostly, I’ve been working on leather projects. I made and listed a bunch of small items over the last few days, and my shop is looking fantastic if I do say so myself! 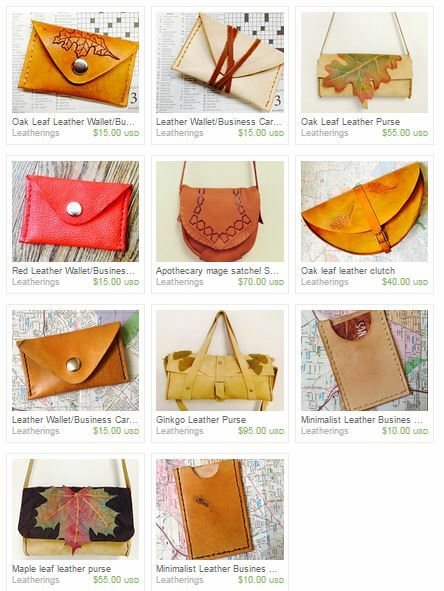 I don’t expect all you who read this blog to check my Etsy shop regularly (hell, I can’t afford most of the purses that I make and list) — so here’s a screen shot. Anyway – totally gratifying, and I’m glad I took everyone’s advice and finally opened an Etsy shop.